Step 1: Register for the event. We mail out your medal and bib after you register. You do not have to wait for your package to earn your medal. Step 2: Earn your medal by Running/ Walking/ Hiking/ Cycling/ Swimming/ Mountain Biking/ Rowing/ Downhill Skiing/ Cross-Country Skiing/ Snowboarding/ Skating/ Wheelchair/ Nordic Walking/ Camping/ Elliptical/ Duathlon/ Triathalon or any other way you would like. Step 3: Update your results after you finish. Your results are only displayed on the result page if you want them to be. What distance is this race? 1 Mile, 5K, 5 Miles, 10K, 10 Miles, 13.1 Miles, 25 Miles, 50 Miles, 100 Miles, or you have the option to select other. What will I receive with my registration? 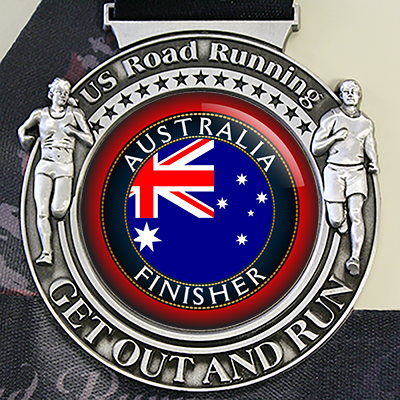 3 inch finisher medal with a colorful insert in the middle of the medal and 1.5 inch colorful ribbon. Price includes shipping inside the US. Engraving plates and shirts are add on options. How can I do a group order? How do I post photos to our social media? Live Race and Race Timing Question? Virtual Race or Fundraiser Question?